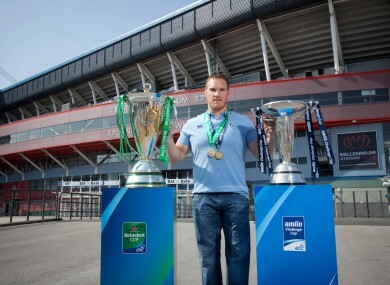 Pictured with the Heineken Cup and the Amlin Challenge Cup at the Millennium Stadium is Gethin Jenkins of the Cardiff Blues, a previous winner of both trophies. THE MILLENNIUM STADIUM has been a magnificent setting for four of Irish rugby’s greatest moments in recent history. Munster captured their two Heineken Cup trophies at the Cardiff ground [2006 and 2008] and Leinster won the second of their three at the same venue . In 2009, Ronan O’Gara’s drop goal and Stephen Jones’ penalty miss gave Ireland their first Grand Slam in 61 years. The ERC confirmed this morning that the Millennium Stadium will, once again, play host to the Heineken Cup Final. The match will take place at 5pm on 24 May. All four Irish provinces are included in the main Heineken Cup draw and will have varying levels of ambition about securing cup glory at the 74,500 capacity stadium. The winning run at the Millennium began in 2006 when Munster defeated Biarritz 23-19. They returned to wales two years later and beat Toulouse 16-13 to confirm their reputation as one of Europe’s truly great sides. The ground was also the setting for Leinster’s miraculous comeback against Northampton Saints. Trailing 22-6 at half-time, the Blues were inspired by Jonny Sexton and rallied to a 33-22 victory. The Amlin Challenge Cup Final will be held at the Cardiff Arms Park, next door to the towering Millennium Stadium, on 23 May. Leinster are the current cup holders but will be hoping to make it through to the Heineken Cup knock-out stages to avoid defending their trophy. Tickets for the 2014 Heineken Cup and Amlin Challenge Cup finals will go on sale in early September. What do you think of the new Munster rugby kit then? Email “Good news Leinster and Munster fans, Millennium Stadium gets Heineken Cup Final”. Feedback on “Good news Leinster and Munster fans, Millennium Stadium gets Heineken Cup Final”.